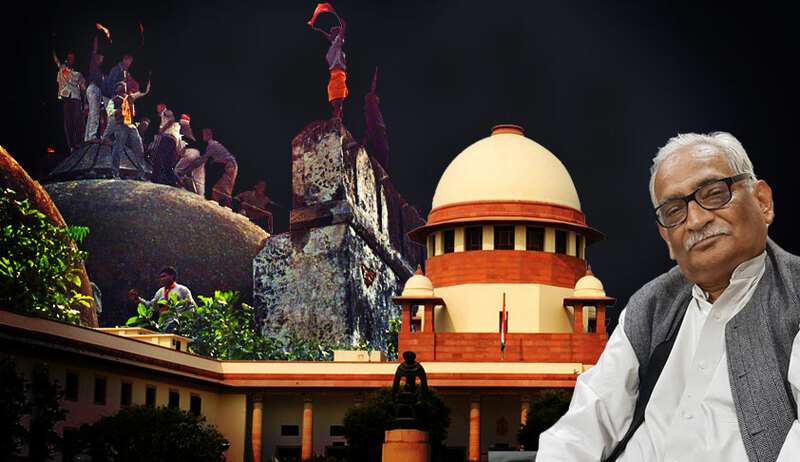 On Friday, the hearing in the Ayodhya dispute commenced in Supreme Court dramatically with an advocate vehemently objecting to Senior Counsel Rajeev Dhavan’s comparison of the destruction of Babri Masjid to Taliban destroying Bamiyan statues. At the previous hearing on July 13, Dhavan, appearing for the Sunni Waqf Board, had commented, “What happened in 1992 can be called an act of the Hindu Taliban.It could not have been done, it should not have been done.”. Today, a lawyer aggressively objected to that the remark, saying it “tarnished the Hindu image”. “This comment was uncalled for. If there has to be a serious debate, there can be no name calling”, countered Senior Counsel C. S. Vaidyanathan. “It is a name based on the wanton destruction of the mosque! They acted in a Talibani fashion”, asserted Dr. Dhavan. He, however, clarified that the comparison was made in the context of his argument that the right to prayer got infringed with the demolition of the mosque. He stated that this stand that the destruction of mosque infringed an essential feature of Islam faith was adopted before the Allahabad High Court. Meanwhile, another advocate reacted strongly to the Taliban comparison, and advanced towards Dr.Dhavan, shouting so forcefully and repeatedly that Chief Justice Dipak Misra was compelled to ask him to leave the courtroom. Urging all counsel to maintain decorum of the court, the Chief Justice noted that Dr. Dhavan’s comment was “absolutely inappropriate” and that he should have exercised the restraint. “The symbols, metaphors, imageries or any adjectives used must be such which may have acceptance of the court”, said the Chief Justice. Quoting Justice M. V. Verma’s observation in Ismail Faruqui (1994) that “the Hindu community must, therefore, bear the cross on its chest, for the misdeed of the miscreants reasonably suspected to belong to their religious fold”, Dr. Dhavan said that he disagreed with the Court’s view. He emphasised that the destruction of mosque was as evident a reality as the rising of sun in the east. “I disagree with Your Lordships and I have the right to. I can even disagree on a judgment. It does not amount to contempt”, he said.